For those of you with a hen do coming up you’re probably worrying about what to pack. It’s never easy to be prepared when you have no idea what you’re preparing for. I’ve put together today’s Shopping List with you in mind as a hen do packing guide. 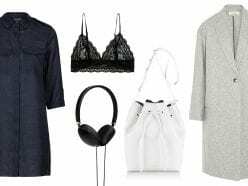 Here are a few pieces that will get you through a couple of possible scenarios, the spa day or the fancy brunch/lunch/tea/dinner (delete as appropriate). It’s possible that you’ll be doing some sort of activity that involves being on your feet so make sure you pack a pair of comfy shoes like the Ash Illusion slip-ons above, these ones can be found on the Sarenza website and also come in black.